Basics for a Bargain: The Fringe Trend, Inspired by Scarlett Johansson, Heidi Klum, Jamie Chung & More (Dedicated to Marlene)! When it comes to seeking out some style inspiration, turning to my friends is always the best resource, which is how I came to find (from one Marlene) that there was a big trend that’s been building in the fashion world. Fringe is back. 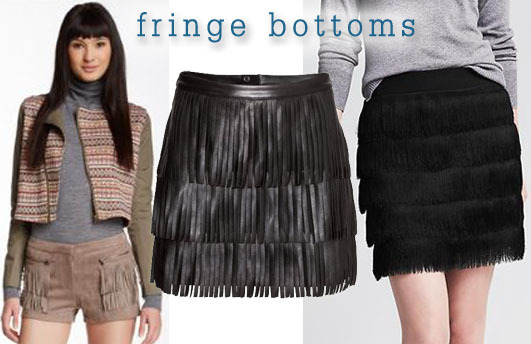 Have no fear, when it comes to fringe, it’s all about moderation. I’m not talking about a full-on Western look, or anything crazy from the 70s, but a nod to another time or fantasy world isn’t so bad to include in your day-to-day wardrobe. Fringe was spotted on the Spring Summer 2015 runways all over the world, especially from designers like Etro, Givenchy, Fendi, Proenza Schouler, Marco de Vincenzo, & Elie Tahari. Over the years, celebrities have also been sneaking this trend on the red carpet, wearing fringe on dresses, tops, capes, & skirts. When done right, fringe can do no wrong. For example, fringe works on actress Scarlett Johansson (in Preen), Shameless star Emmy Rossum (in Stella McCartney), Bond girl Naomie Harris (in Naeem Khan), & model Suki Waterhouse at a Topshop event. Also, during this past season of Project Runway, winner Sean Kelly designed this flirty cobalt & black fringe gown for the show’s host Heidi Klum to wear at last year’s Creative Arts Emmy Awards. Also, rocking the fringe trend are Divergent star Shailene Woodley (in Emilio Pucci), dancer-turned-singer-turned-actress Julianne Hough (in Sass & Bide), & fashion blogger Jamie Chung (in BCBG Max Azria). 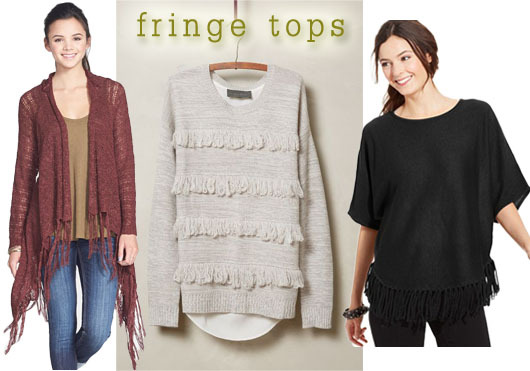 To integrate fringe into your wardrobe, here are some affordable & easy-to-wear fringe toppers & fringe bottoms that are sure to dress up your casual separates & create new opportunities to get the most out of your closet. SHOP: dolman top ($17.99) in black @Macy’s, fringed pullover sweater ($49.95) in light grey @Anthropologie, hooded cardigan ($42.00) in oxblood @Nordstrom. SHOP: fringe shorts ($29.97) in tan @Nordstrom Rack, faux leather skirt ($24.95) in black @H&M, & fringe mini ($34.99) in black @Banana Republic. 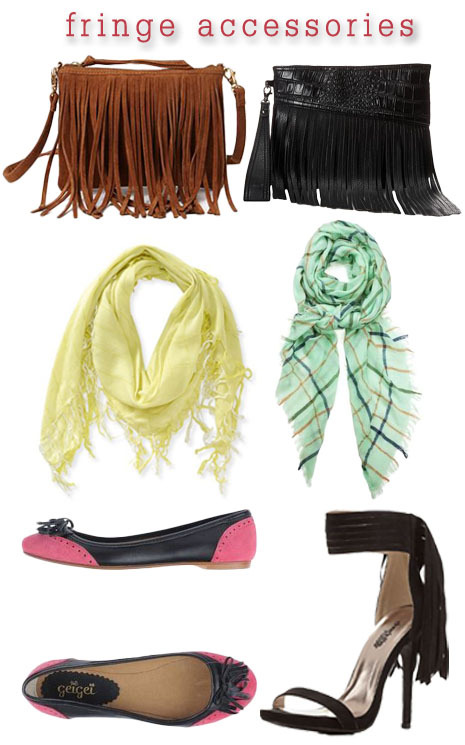 Lastly, fringe accessories are also here to stay, including bags, scarves, & shoes. When it comes to adding detail to your look, fringe is a fresh way to go, also coordinated with metallic grommet, textured panels, & colorblocking. SHOP: crossbody bag ($19.90) in brown @Forever 21, clutch ($35.99) in black @6PM, plaid scarf ($18.95) @Shoptiques, shimmer scarf ($9.99) in lime @Aeropostale, heels ($38.99) @Charlotte Russe, & ballet flats ($49.00) @YOOX. Do you wear fringe? Do you prefer fringe separates, dresses, or accessories? Which celebrity is wearing fringe the best right now? For more stylish posts, check out Runway Rundown galleries featuring Elie Saab & Atelier Versace, Rosie Huntington-Whiteley’s London street style look for less, ear cuffs & front to back earrings inspired by Keira Knightley & Kate Mara, & how to style prints & patterns like Lea Michele & Gwen Stefani! Happy Styling! This entry was posted in Accessories Access, Basics for a Bargain, Luxury Look-Alikes For Less, Quickie Darling Deal & Steal, Red Carpet Review, Runway Rundown, Show Me The Shoes, Splurge or Save?, Style Darling Daily and tagged 6pm, Accessories Access, Aeropostale, affordable fashion, Anthropologie, Banana Republic, Basics for a Bargain, Charlotte Russe, designer, Elie Tahari, Emmy Rossum, Etro, fashion, Fashion Week, Fendi, Forever 21, fringe, fringe bag, fringe flats, fringe heels, fringe scarves, fringe shoes, fringe shorts, fringe skirt, fringe sweaters, fringe tops, fringe trend, Givenchy, H&M, Heidi Klum, Jamie Chung, Julianne Hough, Luxury Look-Alikes for Less, Macy's, Marco de Vincenzo, Naomie Harris, Nordstrom, Nordstrom Rack, Proenza Schoulder, Quickie Darling Deal & Steal, Red Caret Review, runway, runway rundown, Scarlett Johansson, Shailene Woodley, Shoptiques, Show Me The Shoes, Splurge or Save?, spring fashion, Spring Summer 2015, style, Style Darling Daily, style for days, Suki Waterhouse, YOOX. Bookmark the permalink. ← Runway Rundown: Elie Saab’s Spring 2015 Couture Collection from Paris!